There are many different nuts in the world. They are one of the best foods we can eat for our health and help protect against a variety of chronic diseases. This guide will cover some of the most popular types of nuts and provide all the essential information you need. What are the best low carb nuts? And which nuts have the most nutrients? This article provides the answers to all these questions and more. First, here are the main macronutrient details for every nut at a glance. For each nut, you can see a data table with the macronutrient details and the amounts of omega 3 and 6. You will also find a list of the six most significant vitamins and minerals each nut contains and a breakdown of the benefits and drawbacks. Almonds originated in the Middle East and only recently spread around the world. They are one of the healthiest kinds of nuts and absolutely packed with beneficial nutrients. Almonds contain large amounts of fat and moderate amounts of both protein and carbs. On the positive side, almonds have some very beneficial impacts on blood sugar. Research shows that they reduce blood sugar and insulin levels in diabetics as well as non-diabetics (2, 3, 4). As high blood sugar and insulin levels are associated with every major chronic disease in the book, this is a great benefit. Further to this, people consuming almonds show lower levels of oxidative damage, a healthier lipid profile, and higher satiety levels (5, 6, 7). Almonds contain a large amount of phytic acid, a known antinutrient which may block absorption of minerals. However, phytate has both positive and negative effects on health and is likely beneficial in small amounts. The key: stick to a sensible amount (8, 9). Compared to other kinds of nuts, the omega 6 to 3 ratio in almonds is the highest. However, providing you’re getting enough omega 3 from oily fish and pastured animal foods, a few servings a week should be fine. As you can probably guess, Brazil nuts originate—and still mainly grow—in the Brazilian forests. 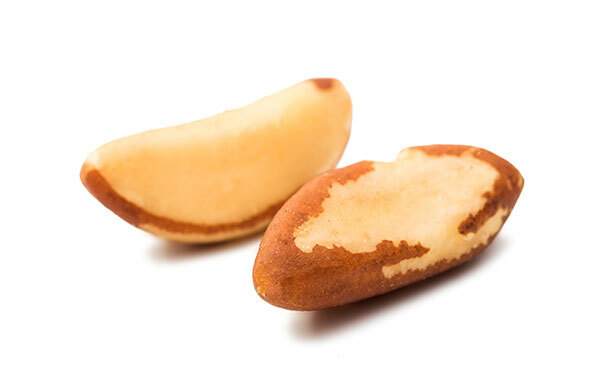 Brazil nuts are the single best source of selenium in the world, an important mineral for health. However, some people are becoming deficient in it due to selenium soil depletion; just 2 or 3 brazil nuts provide a huge amount of the mineral (11). Studies show that Brazil nuts improve lipid profiles. For example, just several hours after a 20-gram dose LDL and triglyceride levels significantly drop and HDL increases (12). Brazil nut consumption improves the body’s antioxidant status. A randomized controlled trial also shows that Brazil nuts decrease oxidative stress and improve the lipid profile (13, 14). Brazil nuts contain such a high amount of selenium that there are concerns over potential overdose and toxicity issues. In a trial, school children eating 15-30g per day all had excessive selenium levels associated with toxicity risk (selenosis). With Brazil nuts, less is definitely more; a handful per week is more than enough (15). See this full guide to Brazil nuts for more information. Cashews predominantly come from Asia and Africa, with most commercial nuts coming from Vietnam and Nigeria. They are one of the most popular varieties of nut and contain a nice mix of nutrients. Raw cashew nuts contain a significant level of some health-protective compounds, such as beta-carotene, the antioxidants lutein and zeaxanthin, vitamin E, and oleic acid. Also found in eggs, lutein and zeaxanthin are very beneficial for our eyesight and help protect against macular degeneration (17). Cashew nuts provide a decent source of copper, manganese, and magnesium. A randomized, controlled trial investigating the effects of cashew nuts on the metabolic syndrome found that cashew nut intervention diets had no effect. Compared to the control group, the cashew nut group failed to show any improvements in cholesterol, blood pressure, or blood glucose readings (18). Cashew nut allergies are common, and they can be even more serious than peanut allergies. For example, studies show that the risk of severe reactions, including anaphylaxis, are more common than in allergic reactions to peanuts (19, 20). 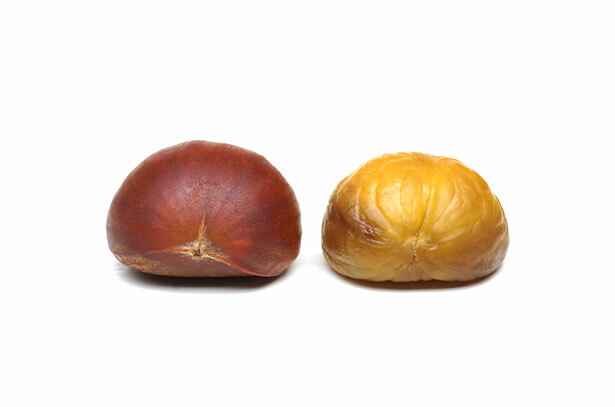 Chestnuts are different from other kinds of nuts in that they are predominantly starchy carbohydrate. As a result, if you’re looking for healthy fats then it’s better to look elsewhere. As one of the most popular types of nuts, hazelnuts are delicious and used in all sorts of food products. In short, they are one of the most nutritious nuts around and have numerous research-backed benefits. Hazelnuts have protective effects against cardiovascular disease. In fact, participants consuming a hazelnut-enriched diet have improved arterial dilation, reductions in LDL and triglycerides, and increases in HDL. Furthermore, oxidized-LDL levels and inflammatory markers are “significantly reduced” (23). A randomized study involving type 2 diabetes patients showed that a hazelnut-enriched diet helps prevent a reduction in HDL levels. This symptom commonly occurs in diabetics and it is a significant cardiovascular risk factor. Also, compared to patients on a control diet, the hazelnut group had significant reductions in triglycerides (24). A systematic review and meta-analysis of nine clinical trials showed that hazelnuts reliably and consistently lower cardiovascular risk factors (25). Hazelnuts are a significant source of polyphenols and exert powerful antioxidant effects on the body (26, 27). There aren’t many drawbacks with hazelnuts, but similar to all nuts they can cause allergic reactions. And sometimes these effects can be severe (28). However, they are the most delicious. With a yummy, buttery taste, no other nuts come close. The taste. Is there a tastier nut? 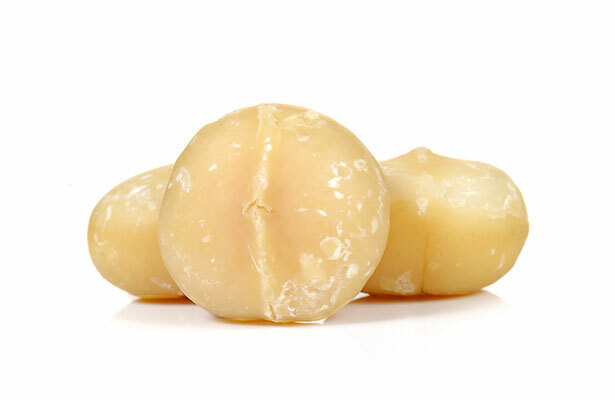 Not many foods top macadamias! Consumption of macadamias decreases the risk of cardiovascular disease by reducing triglycerides and increasing HDL levels (30). Animal studies show that macadamia nuts reduce inflammation and aid in muscle repair following strenuous exercise (31, 32). The price; macadamias are typically the most expensive nut. However, you can get them for a reasonable price if you’re willing to buy online in bulk. Peanuts are not technically a nut; they are a legume. However, as they are known as a nut in popular culture, they make the list. 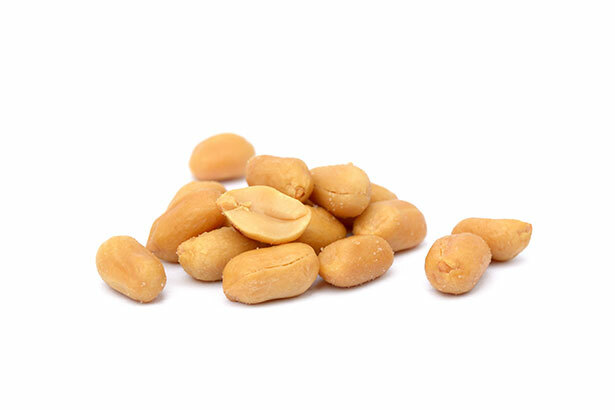 A cardiovascular risk intervention group were provided with peanuts for a 3 or 8-week study. Participants all experienced lower triglyceride levels and increased serum levels of minerals, particularly magnesium (34). Peanut allergy is a very real, prevalent, and serious condition. This allergy affects approximately 1% of infants and 0.6% of children, and it can be fatal (35). Pecans are one of the most popular types of nuts in baking and for desserts. However, they taste just great on their own. Pecans are one of the most polyphenol-rich nuts in existence. Studies show that these compounds are absorbable and contribute to our body’s defense systems (37, 38). Research shows that daily consumption of pecans reduces triglyceride levels (-11%) and increases high-density lipoprotein (+6%) (39). Pecans contain a significant amount of omega-6, and the omega 6 to 3 ratio is very high. See here for a full guide to pecans and their benefits. 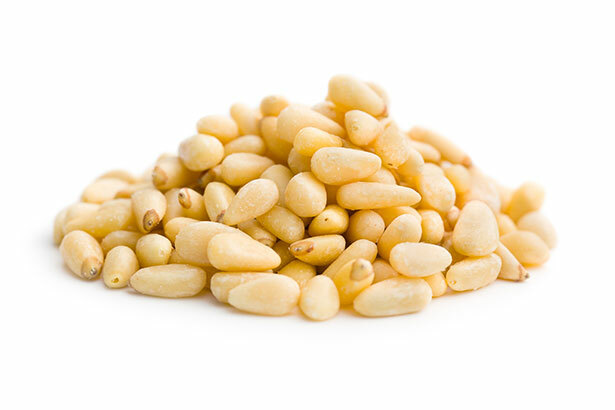 Pine nuts are one of the least common varieties of nut. Similar to other tree nuts, pine nuts contain a range of health-protective polyphenolic compounds (41). Animal studies suggest that pine nuts may help improve mitochondrial oxidative metabolism, showing promise for use as a tool to fight obesity (42). Together with several other nuts, pine nuts also contain a significant amount of omega-6 and they have minimal omega-3 content. Pine nut allergies are prevalent and often result in anaphylactic shock (43). Cacogeusia, otherwise known as “pine mouth,” is occasionally a problem with pine nuts. Following ingestion of pine nuts, some people experience a metallic or bitter taste in their mouth. Surprisingly, this phenomenon can last for up to two weeks, and other symptoms include abdominal cramping and nausea (44). For further information, see this complete guide to pine nuts. Replacing carbohydrate-based snacks with pistachios significantly reduces circulating triglyceride levels (46). A randomized trial suggests that pistachios may have a positive impact on exercise performance, and on oxidative stress levels following exercise (47). A further randomized trial found that pistachios “beneficially affect CVD risk factors in a dose-dependent manner” (48). Randomized controlled trials show that a daily serving of pistachios significantly reduces LDL-oxidation in patients with hypercholesterolemia (49). 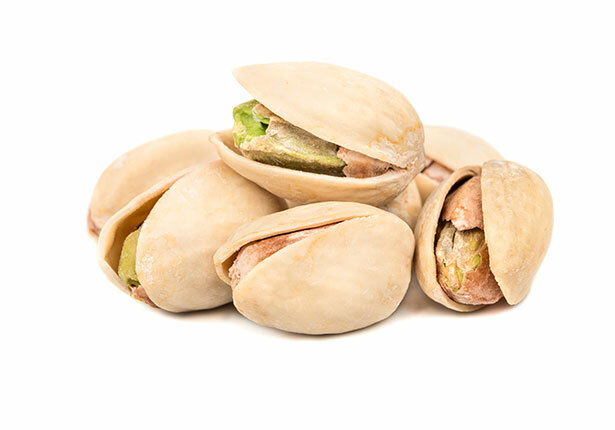 Eating pistachios often involves a fair bit of work — and sore thumbs from opening those shells! The source is important – it isn’t unusual for pistachios to contain aflatoxins (mold) over the legal “safe” limit (50, 51). See this full guide to the nutrition benefits of pistachio nuts for more information. Walnut consumption improves endothelial function, decreases blood pressure, lowers blood glucose, and reduces diabetes risk (53, 54). The PREDIMED study of 7447 elderly participants found that walnut consumption decreased cardiovascular risk and extended lifespan (55). 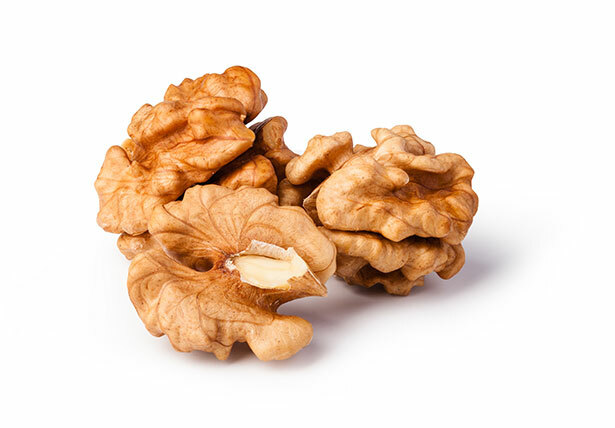 Walnuts contain significant amounts of phytochemicals and healthy fats. Notably, they seem to have positive effects on brain health and help maintain healthy cognitive function (56, 57). See this complete guide to walnuts for more information. All nuts are full of healthy fats, and the majority contain significant amounts of polyphenols. However, if you’re looking for the most nutritious nuts, then almonds and Brazil nuts are an excellent place to start. On the other hand, if your priority is the best tasting healthy snack then there’s only one option: macadamia. To sum up, you won’t go wrong with any of these options. Any type of nut is a healthy choice. Thank you for detailed explanation. I am taking 780 mg omega 3 supplements daily to balance 6:3 ratio. Most keto recipes have almond or hazelnut powder so i am consuming significant amouns of omega 6. Do you think it could be possible to balance it with 1-2 omega 3 pills? Hi tj, if you are consuming “significant amounts” then it will be hard to balance them with 780 mg omega-3 supplements. Also, it is better to keep the ratio relatively balanced rather than chasing omega-6 intake with omega-3, if that makes sense. I would cut down on the keto baking recipes and eat more whole foods – they are OK as a treat sometimes though. Other great sources of omega-3 include mackerel, salmon, sardines, herring and trout.